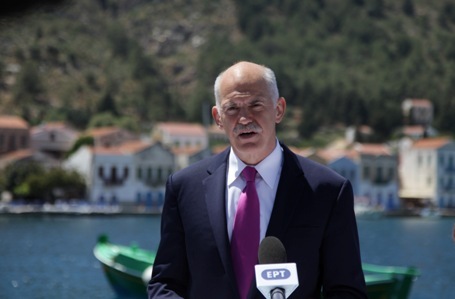 On Friday 23 April, 2010, the television screens of every household in Greece turned to the live transmission of the official announcement of Prime Minister Yorgos Papandreou as he announced the full extent of the government-debt crisis in actual figures and proclaimed the initiation of an EU “support mechanism”. This consisted of the signing of a memorandum and the implementation of bailout packages, structural reforms and austerity measures. The severity of this speech was ironically counterbalanced by the serenity of the natural background of the picture – the coast of a remote Greek island, which could have emerged from a whimsical storyboard drawn by a professional production designer. Paraphrasing the well-known song of Gil Scott-Heron (“The Revolution Will Not Be Televised”, 1971), the evolution of the crisis would not be just televised: From that moment in time it was something divertingly cinematic in its groundings. The popularization of the term “Greek crisis” in international media discourse coincided with the wide diffusion of a cultural product that in the previous years was renowned for its introversion. Over the course of the last six years, contemporary art-house Greek films have managed to accumulate dozens of awards and distinctions in film festivals. Despite the times of radical recession, Greek film production expanded its distribution network in unexplored territories and ensured significant revenues. In addition to the above, even independent institutions for the research and promotion of Greek film cultures were launched. Yet despite this struggle for visibility, the most prominent feature of Greek films when presented abroad was the label of the cinema of “crisis”, which was attached to every exportable cultural product in the field. In this six-year-period, contemporary Greek cinema was alternatively labelled as the “weird wave”,  arguably because it showcased a great number of on-screen characters who are social misfits that move awkwardly in dysfunctional environments. However, as the attribute of “weird” sounds more fitting to human behaviour than to an emerging film genre, the linkage between the “weird”, the crisis, and the aesthetic and cultural specificity of a (trans)national cinema, facilely reads as beneficial for the network of production, creation, presentation, distribution, consumption and perception of contemporary Greek film. This is not the first time that a “wave” has burst out in Greek Cinema in the shape of an epiphany. Between 1950 and 1970, during the age of growth of the Greek economy, Greek film production ascended and reached what is now remembered as a “golden age”. Organized studios flourished; popular genre films – comedies, musicals and melodramas – were produced in large numbers; a local star system rose; the perception of the country, as depicted in these films, was one of an emerging modern society, prosperous and steady, economically growing yet grounded by middle class morals. Not surprisingly, the first new wave of “New Greek Cinema”, widely known as NEK, was more or less synchronized to other new waves in world cinema (Nouvelle Vague in France, Free Cinema in Great Britain, Cinema Novo in Brazil etc.) emerged as another aspect of European modernization – but maintained a couleur locale. Younger filmmakers, following the model of auteurism, dealt with politically sensitive subject matters and neglected any possible commercial potential of the medium. The list of filmmakers and their groundbreaking work is long and full of landmarks: Pantelis Voulgaris shot his sophomore film Happy Day (1976), based on a novel by Greek writer Andreas Franghias, with a tiny crew on an island that served as an exile place for the leftists after the Civil War; To Vary Peponi (1977) by Pavlos Tassios comments on the desolation of Greek countryside in the age of modernization in the ‘60s and the hardships of the lower working class in the urban environment that lead to the formulation of syndicates; Nikos Koundouros, who was an active member of the left-wing resistance movement EAM-ELAS during the war, shot a series of allegorical films (Mikres Afrodites/Young Aphrodites , Vortex: The Face of Medusa , 1922 , Brothel ) and documentaries To Tragoudi tis Fotias/Song of Fire (1975)], aiming at presenting a non-linear timeline of Greek history; and, of course, Theodoros Angelopoulos was the cornerstone of the wave of the “New Greek Cinema”, no matter if his fame exceeded the limits of his country of origin. The dominant aesthetic influence to this new wave came from the field of literature, the “Generation of the 30s”: the group of writers envisioning the ideal of a transgression of Hellenism through the centuries and adapting Greek symbols, themes and motifs to avant-garde techniques of symbolism. Thus, modernization in the first new wave had to be achieved through nationalization and a certain use of Greek language was crucial to that direction. In several Greek films of the late 20th century, scripts are either based on novels or bear the signature of Greek writers – filled with extensive pieces of prose or extracts of monumental works of Greek literature woven into the narrative in the form of long-period sentences, blends of lyrical style and allegories. Departing from this dark, almost cryptic language, the heroes of the “Greek Weird Wave” appear self-conscious of the performative aspect of language and its functionality. The appearance of a new, hybrid spoken language is found in the dialogue script, consisting of word plays, metaphorical schemes, elliptical sentences, loanwords and made-up words. Further the concept of role-playing is central for narrative and character development. Once again, examples from recent Greek productions are numerous and illuminating. For instance, the main character of Athina Tsangari’s film Attenberg (2010) is a 23-year-old woman who lives in a small town built on the fringe of an aluminum plant. Born to a French mother, she speaks broken Greek andhen she is alone, she murmurs lyrics from songs by French pop artists and by her favorite post-punk band, Suicide. Whenever she has to take care of her terminally ill father, she repeatedly plays with him their favorite word game, exchanging words that sound the same in Greek (eg. lima-kyma-tima–vima, and so on). In a central scene of the film, these games evolve into an imitation game, as the random sounds turn into funny shrieks, and the two characters start pretending they are monkeys – just like the ones they enjoy watching in the documentaries of their favorite filmmaker David Attenborough. Evenly spread over the film’s narrative, the scenes where the protagonist experiments with words and her voice inflection become milestones in her coming-of-age process. Respectively, in Yorgos Lanthimos’ Alps (2011) the title refers to a group that offers families who have lost loved ones an unorthodox service: they impersonate the deceased. The names of the group’s members remain unknown to us as they use monikers instead. The group is named “Alps” for two important reasons. First, it doesn’t indicate the group’s action, and second, the mountains of the Alps can never be substituted as “any substitute would be smaller and less imposing.” Thus in this context language is used as a means to conceal action and obscure the characters’ identity. Furthermore, in Hora Proelefsis/Homeland (Syllas Tzoumerkas, 2010), the scene of a primary school teacher repeating verses of the Greek national anthem in front of her students in the mode of a refrain functions as a leitmotif bringing together different scenes from the life of a large dysfunctional family. In this case, this absurd spoken word becomes a reminder (perhaps an educational tool) of someone’s origin and social role. The transition from the first new wave in Greek cinema to the latest one, as a shift between labels according to a rigid classification system, can reflect the transition from one conception of cultural identity to another – what Stuart Hall describes as the passage from the sociological subject to the postmodern subject. According to Hall, the notion of the sociological subject reflects the growing complexity of the modern world and the awareness that this inner core of the subject is not autonomous and self-sufficient, but is formed in relation to “significant Others” who mediate to the subject the values, meanings, and symbols – the culture – of the worlds he/she inhabited. The post-modern subject, instead, is conceptualized as having no fixed, essential, or permanent identity. Identity becomes a movable feast – formed and transformed continuously in relation to the ways we are represented or addressed in the cultural systems which surround us, reluctant to narrow down to a ready-made taxonomy. In the last five years, Greek society has been destined to negotiate the thin boundaries between the “inside” and the “outside”, between personal and public worlds, while the attribution of labels as an internalised “external” necessity homogenized contradictory elements that changed the mode in which Greeks perceive identifications and representations of themselves. Labelling Greek cinema as a cinema of crisis presents crisis as an epiphany – both as a sign of rupture between time and present (hence a natural border), and as a surface (as the etymology of the word implies) that separates or mirrors, serving as a tabula rasa where everyone can write his/her own story, or as a metaphor for superficiality as opposed to profoundness. Breaking the label of “weird”, strongly associated to “crisis” in cinema and society is the ultimate act of emancipation for audiences that comprise of active citizens neglecting the idea of governance through classification, especially when it is superimposed in the cinema world. If, in the social reality of the gradually receding civil liberties, crisis is used as a flattening term to diminish the right to differ and to extinguish alternation in the artistic realm, the rendering of aesthetic values to the semantics of crisis weirdly calls for a radical reconceptualization of an-Other way to watch beyond the mirroring image. Geli Mademli is a Ph.D. candidate at the Amsterdam School of Cultural Analysis at the University of Amsterdam, working in the intersection of media studies, archival studies and film museology. She studied Journalism and Mass Media (BA), Film Theory (MA) and Cultural Studies (MA). For the last few years, she has been working for the Thessaloniki Int’l Film Festival as a program assistant, catalogue coordinator and editor of its annual publications, and she is as a freelance journalist, specializing in film and media. She is a member of the editorial board of the Journal of Greek Film Studies FilmIcon. “Dogtooth: Interview with Yorgos Lanthimos,” Electric Sheep, April 5, 2010. Accessed January 31, 2016. Lydia Papadimitriou, “Locating Contemporary Greek Film Cultures: Past, Present, Future and the Crisis,” FILMICON: Journal of Greek Film Studies, Number 2, September 2014, 2. Brady Link, “Greek Cinema: The Inconspicuous Hope for Recovery,” Euroviews, April 22, 2015. Accessed January 31, 2016. See Contemporary Greek Film Cultures. Accessed January 31, 2016. Hellenic Filmbox Berlin. Accessed January 31, 2016. Steve Rose, “Attenberg, Dogtooth and the Weird Wave of Greek Cinema,” The Guardian, August 27, 2011. Accessed January 31, 2016. Rose highlights these characters in film like Attenberg (Athina Tsangari, 2010), L (Babis Makridis,2011), Boy Eating the Bird’s Food (Ektoras Lygizos, 2012), and Knifer (Yannis Economidis, 2010). Kostis Theodossopoulos, “Elliniko Cinema 2013: I Anaskopisi,” Cinema, Number 29, December 2013, 72. Alex Lykidis, “Crisis of Sovereignty in Recent Greek Cinema,” Journal of Greek Media & Culture, Number 1, 2015, 10. Boyd van Hoeij points out that “[t]hough much of southern Europe especially is going through a deep economical crisis and governments are severely pruning their culture budgets, the outbursts of creativity, from places such as Spain, Portugal and, especially, Greece, are not only noteworthy but arguably even a result of the crisis.” Boyd van Hoeij, “The Greek New Wave,” E-Dossier, Number 47, May-June 2013, 106. Olga Kourelou, Mariana Liz and Belén Vidal, “Crisis and Creativity: The New Cinemas of Portugal, Greece and Spain,” New Cinemas: Journal of Contemporary Film, Number 12, 141. Maria Chalkou, “A New Cinema of ‘Emancipation’: Tendencies of Independence in Greek Cinema of the 2000s,” Interactions: Studies in Communication & Culture, 3:2, 259. For more information on the history of modern Greek cinema see Vrasidas Karalis, A History of Greek Cinema, (London: Continuum, 2012), especially “The Formalist Moment: The Inward Gaze: 1971-1995,” 143–191. Stuart Hall, “Cultural Identity and Diaspora,” Identity: Community, Culture, Difference, edited by J. Rutherford (London: Lawrence & Wishart; 1990), 390. Chalkou, Maria. “A New Cinema of ‘Emancipation’: Tendencies of Independence in Greek cinema of the 2000s.” Interactions: Studies in Communication & Culture 3: 2, 243–61. Hall, Stuart. “Cultural Identity and Diaspora,” Identity: Community, Culture, Difference, ed. by J. Rutherford. London: Lawrence & Wishart; 1990.
van Hoeij, Boyd. “The Greek New Wave,” E-Dossier 47 (2013), 106–107. Karalis, Vrasidas. A History of Greek Cinema. London: Continuum, 2012. Kourelou, Olga, Mariana Liz, and Belén Vidal, “Crisis and Creativity: The New Cinemas of Portugal, Greece and Spain.” New Cinemas: Journal of Contemporary Film 12, 133–15. Lanthimos, Yorgos. “Dogtooth: Interview with Yorgos Lanthimos.” Electric Sheep, April 5, 2010. Accessed 31 January 2016. http://www.electricsheepmagazine.co.uk/features/2010/04/05/dogtooth-interview-with-giorgos-lanthimos/. Link, Brady. “Greek Cinema: The Inconspicuous Hope for Recovery.” Euroviews, April 22, 2015. Accessed January 31, 2016. http://euroviews.eu/?p=1361. Lykidis, Alex. “Crisis of Sovereignty in Recent Greek Cinema.” Journal of Greek Media & Culture 1 (2015), 9–27. Papadimitriou, Lydia. “Locating Contemporary Greek Film Cultures: Past, Present, Future and the Crisis.” FILMICON: Journal of Greek Film Studies 2 (2014), 1–19. Rose, Steve. “Attenberg, Dogtooth and the Weird Wave of Greek Cinema.” The Guardian, August 27, 2011. Accessed January 31, 2016. http://www.guardian.co.uk/film/2011/aug/27/attenberg-dogtooth-greece-cinema. Theodossopoulos, Kostis. “Elliniko Cinema 2013: I Anaskopisi.” Cinema 29 (2013).